The same-origin policy restricts how a document or script loaded from one origin can interact with a resource from another origin. Same-origin Policy is used as a means to prevent some of the Cross-site Request Forgery attacks. The “origin” is the same if three things are the same: the protocol (http vs. https), the domain (subdomain.yoursite.com vs. yoursite.com vs. google.com), and the port (: 80 vs.: 4567). Using JS, we would be able to fetch resources (typically data like text,html,json,etc) using JSONP where we create a script tag dynamically with src attr pointing to the end source. Insert the script tag into the head section of the page. This will force the browser to fetch the end source similar to how it fetches any other JS or image via http. Originally created for the gaming industry, parallax scrolling is basically a scrolling technique in computer graphics, where a background image moves in along with a foreground images, but at a slower rate. This kind of “special effects” technique creates an illusion of depth for a website. Parallax scrolling is a pretty complicated design technique and you might want to keep the below mentioned points in mind. Start with creating an SEO architecture, eventually moving on to implementation of your design. Parallax Scrolling is really unsuitable for mobile websites or their mobile-friendly versions because it makes websites noticeably heavy. So, if your main site runs parallax scrolling, it is best to remove it from your mobile website since it will in invoke a tedious user-experience. As a web developer, one should be aware that parallax scrolling can cause multiple SEO issues because it adds a lot of weight to a website, and no search engine wants to deal with a content heavy website, including Google. Again, it is recommended that one ascertain as to whether they really want or need parallax scrolling effects on their website. This is because people are averse to change, and if you have a website that has been running for a long time and has high-traffic inflow, it’s best to keep track on how the users or visitors are reacting to the changes on the website. Does Parallax Really Affect SEO? To put all your doubts to rest, yes. If not implemented properly, parallax scrolling can seriously affect your SEO rankings. It is common knowledge that search engines search for and identify websites that are rich in content and functionality. Coincidentally, search engines also loathe heavy website, putting web developers in a really tight spot. It is, however, useful to note that a parallax-enabled website is typically just a single or one-page website. You also know that you aren’t allowed to have multiple H1 headers or meta-descriptions for a website that has all of its content crammed into a single page, no matter how convenient it is for you. So, let’s see what parallax scrolling actually does for your SEO intentions. Parallax-enabled websites have much longer load times than standard websites. And nothing is more annoying than a website that takes forever to load. In fact, statistics have revealed that users will switch websites if the load time exceeds 5 seconds, five seconds! Which means you only have 5 seconds to retain the interest of a potential customer. It might be possible that a parallax page does not work properly across all Web browsers. A page can run properly in Firefox but fail to do so in Google Chrome. The same can happen in the case of Internet Explorer and Safari. It might require extensive testing to make sure that everything works accurately across all web browsers. The biggest risk of running a parallax site may be its inability to run properly on mobile web devices. And with the ever-increasing popularity of mobile smartphones and tablets, non-mobile user friendly websites will definitely be a burden on their business. Another peculiar issue with enabling parallax scrolling is the difficulty for developers to optimize the site for specific keywords. 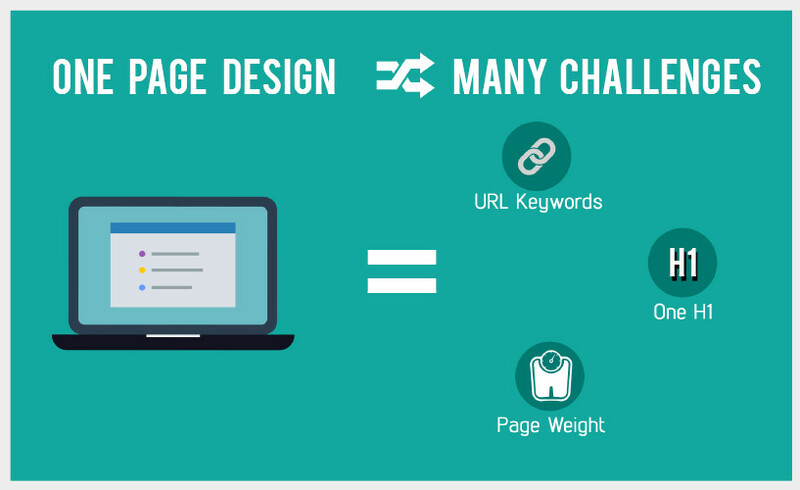 This is because it is difficult to optimize for multiple keywords on a single page of web content, compared to that of a multiple-page website. 5. How to handle Parallax Scrolling and SEO? Irrespective of how complicated a technique parallax scrolling may be, if you really want the parallax effect on your site, there are a few structural ideas that you can use to run your website with parallax scrolling while also keeping it search engine optimized. A solid start would be to assign all internal links to different sections of the parallax website, which would really help the search engines index page content. specific optimization on them. It’s recommended that you use tools like Ajax and the navigation functions to change the URL. This will improve the user experience since they will be automatically redirected down to the webpage to the relevant post with a special URL. Finally, try starting your own blog and keep updating it frequently. This will not only impress your guests by keeping the parallax effect running smooth on your site, but the blog you just created will also increase the flow of traffic to your site. parallax scrolling, Seo parallax scrolling, Seo by admin. What’s this Typescript all About? If you’re a Java programmer, you’ve probably heard of Typescript. But, what exactly is TypeScript? Accuracy with Type Checkers: Getting a platform that makes it easier for developers to create an accurate and predictable code that will eliminate common errors such as typos or incorrect value-type assumptions. Such errors are detected during the compile stage by type checkers. Seamless IDE Integration: With the information of types, an IDE can become more productive by providing useful features such auto-complete. It is open source, but you only get the clever Intellisense as you type if you use Microsoft’s Visual Studio. It is now possible to perform code refactoring operations like renaming functions or variables automatically and safely. In relation to its structuring mechanism, TypeScript introduces the concept of a class-based object-oriented programming, making it much easier to structure code into classes, create a class hierarchy and manage the visibility of data throughout a system. TypeScript uses the concept of internal and external modules. 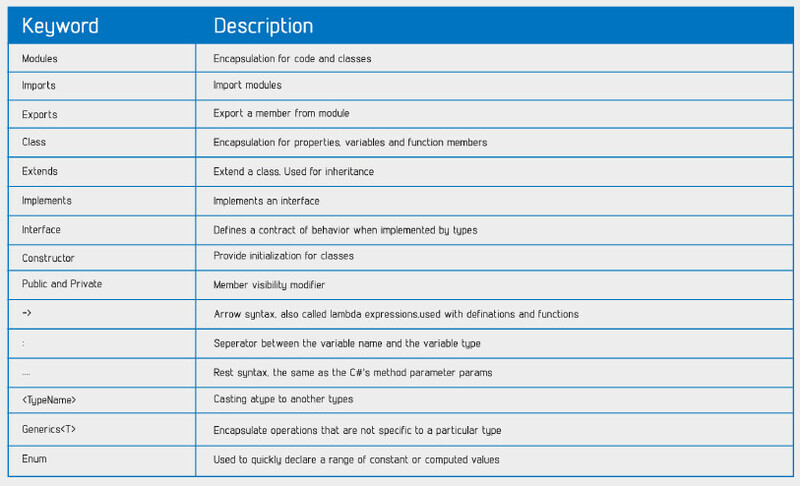 TypeScript’s internal modules follow the same structure as namespaces as they allow defining of symbols like variables classes and the global scope. External modules are how TypeScript defines asynchronous loaded modules for either node.js or require.js module-loadingsystems.TypeScript also employs the use of a module to declare the application program interfaces that third-party libraries expose. A platform for safe and automatic refactoring. High-visibility APIs and type declaration code contracts. Easy error detection during compilation. Class-based object orientation, with private members and an interface module support. There is low or no risk in trying Type- Script since it can be removed as easily as it was installed. It technically boils down to its usage, for example, using TypeScript is much more advantageous for medium-large scale projects, but might not make as much sense for smaller projects. Internet is a medium which evolves constantly and it is very hard to believe that CSS is nearing release of version 4. CSS4 has emerged as a buzzword in web technology arena with CSS Working Group’s release of first working draft on the same. World Wide Web Consortium, the governing body that oversees the development of web standards is already plotting the future of CSS with CCS4. Although CSS4 will not replace CSS3, the work on specifications will go on parallel with CSS3 modules. There are many innovative proposals in CSS4 including parent selector, UI states pseudo classes, reference combinators, logical combinations and namespaces. It has been reported that there is a proposal for responsive design in CSS4 and it will let a web developer apply preload states for slow connections. Cascading script sheet is another much talked about feature of CSS4 and it will be extremely useful for enhancing interaction. According to seasoned web developers, CSS4 technology uses unobtrusive and function style syntax. CLISS (Command Line Interface Styling Script Sheet) is another best feature and it follows a very similar syntax to the CSS. Another fascinating attraction of CSS4 is proper email styling support and it is almost similar to CSS3. With the introduction of this web technology, some old properties have been reintroduced and some are introduced for the first time. Parent selector allows a web designer to style a parent element based on its child element and it is one of the favorite selectors of passionate web developers. Reference combinator consists of two slashes in between CSS qualified names and these slashes are used to define the association between two compound selectors. CSS4 has added few interesting pseudo classes to handle links such as :any-link, :local-link, :target, :scope, :link and :visited. CSS4 introduces a set of UI states that will allow us to style elements depending on their user interface state. :enabled, :checked, :default, :valid and :invalid are the pseudo classes introduced in CSS4. New logical combination pseudo class called: matches ( ) is one of the innovative attractions of CSS4. It is learnt that some more features will be added to CCS4 very soon and they will undoubtedly make the experience of web developer easier. Variable declaration feature in CSS4 will reduce the amount of code redundancy experienced in previous versions of CSS4. It is brand new and no web browser actually supports these features of Cascading Style Sheet 4 yet. As CSS4 is built on CSS3, it is desirable to continue mastering CSS3, its features and applications. As CSS4 is a work in progress, many of the new features may be removed in a later stage. As per industry reports, its new media features will probably include script, pointer, hover and luminosity. When CCS3 was introduced, neither its developers nor others thought that it would become so popular. It is perceived that the same miracle will happen in the case of CSS4 too. Web developers are quite fascinated by the elegant features of CSS4 and they are eagerly anticipating for its official release. Why is Yeoman getting popular? What all can a developer do with it? Yeoman is an open sourced web development tool that has unleashed a new wave for developers. Today, in the web app world there is a current trend of using development tools that provide application framework. Yeoman is a web tool that embodies the current trend of the Indus try, and takes it to the next level! If you are a developer at any stage of experience this tool will come as a delightful surprise. Without a doubt this is one of the best innovations to come to web development in a long time. Since the Google/IO release of Yeoman in 2012, it has been regarded as an innovative step forward into the future of web developing. There is a significant amount of excitement around Yeoman due to the streamlined experience of their less complicated take on modern webapp development. Essentially, the pace at which you can create anything from a simple project to a high caliber web application is impressively quick! In addition to that, Yeoman also allows you to automate the common cumbersome tasks of web developing. This is a development tool that packs a ton of awesome stuff in one package. You can build beautiful and bold designs unlike ever before. Yeoman has a host of features(many of them are open sourced) that are developer-friendly and make the process of developing a high quality web app less of a hassle. Overall, it is likely to decrease your front end/back end workload, solving a lot of your time consuming problems. Yeoman acts as a kick starter generating infrastructures that get you up to speed on projects. All of the frustration and hours spent dealing with the intricacies of web building have been cut in half and your workload has been modernized with a “made simple” approach. One of the stand outs with this application is that work flow is more consistent. Yeoman really lets you get right down to writing code through optimizing a lot of the repetitiveness of web building. Many skeptics feel like Yeoman may be a bit too much to process and an intimidating tool to wrap their heads around. Yeoman attests that they optimize the building process, making the experience efficient, simpler and overall more enjoyable. Google assures that the configuration process and the maintenance of the important “nuts and bolts” of web application are streamlined and made easy, this has never been done before to this level. What Yeoman does exceptionally well is serve as an automating tool, automation equals happiness for the developer. You are now backed by an experienced community of developers who save you time and frustration by alleviating you from many of the technical tasks that stagnate the creative process of web app building. Yeoman also brings swagger and a popularity among the community that most development companies don’t experience; it is quickly becoming the People’s Champion and go-to tool for web development. If you are still wondering why Yeoman is garnering the attention and praise from the developer community, the answer is simple – Yeoman embodies efficiency and accessibility. One thing is for sure, Yeoman is a step forward towards the future of web app development. “Work Less, Do More, and Make Awesome” is a quote from Addy Osmani who is a Developers Programmer Engineer at Google. This is what Yeoman stands for in the developer community. By deciding to use Yeoman you are saying that you want more control at your hands. This is an application geared toward making the lives easier of the novice developer and the expert, while ensuring your overall creative experience is more enjoyable and efficient no matter how simple or complex the project is. Beyond the initial factors that make Yeoman popular today, what should be noted is its ability to enable the user to be more creative. With so much of the workload time reduced due to the streamlined process, Yeoman is more flexible, allowing you to do things at a fluid pace not quite seen to this level before. Improving productivity and creativity is what brings Yeoman to the forefront. web development web development tool by admin. WHICH TECHNOLOGY SKILL PAYS MORE? Technology has penetrated every sphere of life, big and small and almost every single human today relies on it in some way or the other. This is the reason why conventional high paying professions had to humbly make way for Software development, Software Design, Data Governance, Website/Mobile Development, Instructional Design, Technological R&D etc. The nerds had officially arrived and they’d be here for a very long time. The IT industry, in its perpetually evolving nature seeks skilled personnel that would eventually become cogs in its huge wheel. These personnel however, always need to keep updating themselves and learn more to avoid becoming fossils. With this thought in mind, we had set out on the task of finding out which technological skill is paid the most. 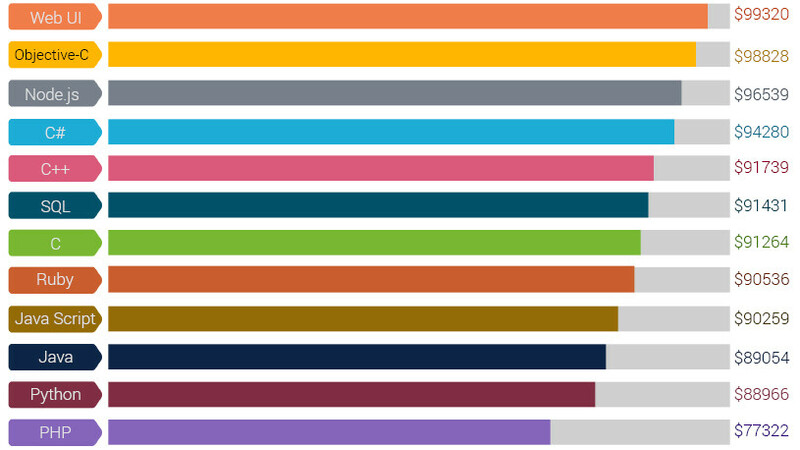 This article presents the data collected from surveys conducted by StackOverflow and IT Recruiters from multiple staffing agencies. According to the report, more than 25000 developers participated in answering the question of which technological skill was highly paid. According to industry experts, developers possessing expertise in niche technologies are those that shall be at the top of the pay pyramid. It goes without saying that in this day and age where competition has become so cut-throat that only the fittest survive and only the fittest among these fittest become leader. The survey also has good news for those who wish to expand their inventory of skills and want to know where the really big money lies. As above mentioned technologies are still an emerging phenomenon, industry stalwarts are willing to pay huge salaries to those proficient in these technologies. 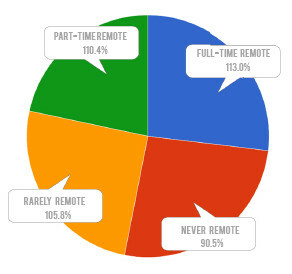 Freelancers have good reason to rejoice because this survey tells us that those who freelance professionally/fulltime, earn more than 40% compared to those who don’t. Being a freelancer has its own perks and advantages. It allows one to learn a lot, as there’s nobody to go and seek assistance from, mistakes and experience are the only two teachers and none can ever be better than them when it comes to imparting knowledge. It gives one the courage to experiment, take risks, explore avenues and aspects that those working for an organization will generally not have the liberty to. Software Design, Software development Technology Skills by admin. How to detect iPad Mini in HTML5? How to use node-inspector with Grunt tasks? Node Inspector is a debugger interface for Node.js applications that uses the Developer tools formerly WebKit Web Inspector. We can use node-inspector to debug grunt task. Node-inspector has the command node-debug, which launches node in a debug state and opens the browser to the node-inspector page, stopping when it hits the first debugger line or set breakpoint. Node.JS Framework NODE.JS FrameWork by admin. Strict vs. quirks modes – How to trigger each and why this matters? Quirks mode and strict mode are the two ’modes’ modern browsers can use to interpret your CSS. Anything before the DOCTYPE, like a comment or an XML declaration will trigger quirks mode in Internet Explorer 9 and older versions. HTML5, HTML5, CSS3 css, html5 by admin.